Massive open online courses (MOOCs) are challenging the notions of traditional education. On one hand they provide low or often no cost access to what many people see as quality education to a broad range of people, many of whom cannot otherwise access to education. On the other hand, they lack some of the fundamentals that come with a traditional learning environment such as social interactions among peers and one on one feedback from instructors. Regardless of their social utility, it is likely that MOOCs will continue to have an impact on the traditional education arena. This article discusses the development of MOOCs, the benefits and challenges associated with them, and their effects on traditional education. The author does not intend to take a position but simply to portray some of the ideas and innovative technologies associated with the service. MOOCs were originally thought of as a way to revolutionize education from the traditional classroom method to a wholly online, interactive, and low-cost alternative. Proponents of MOOCs believed that they were positioned to overturn the century-old model of higher education with the ability to deliver quality education to the masses for a tiny fraction of the price. MOOCs attempt to provide a solution to the rising costs of education by creating a forum for large numbers of learners to participate in educational online courses. Education providers effectively leverage the internet, ICT infrastructure, digital content, open licensing, and social networking to create access to education on a massive scale. MOOCS are a relatively new technological phenomenon, viewed as a natural evolution of OpenCourseWare (OCW) - a practice used by major universities, developed in the late 1990’s, of publishing course content on the internet. The first course to use the acronym MOOC came from a Canadian university. The course entitled “Connectivism and Connective Knowledge” was named after the theory of disseminating knowledge through the MOOC approach. The course was presented to 25 tuition-paying students at the University of Manitoba (Winnipeg, Canada) and provided access to more than 2,000 outside members of the general public who took the course for free. In 2011, Sebastian Thrun and Peter Norvig of Stanford University designed and led the first American MOOC. The course was a huge success, attracting over 160,000 students. Thrun soon launched the for-profit company Udacity and the start-ups – edX the Harvard-MIT partnership and Coursera, the largest MOOC provider. The following year, upwards of 100,000 people signed up for the low-cost and often free courses. The NY Times referred to 2012 as the “year of the MOOC”. 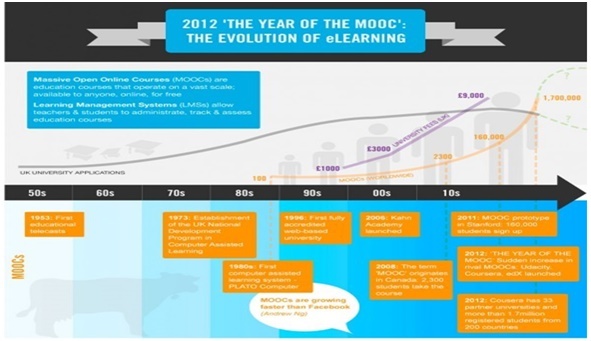 The image below demonstrates the developing platforms that led to the MOOC technology. Designing a MOOC is far more complicated than one might think. Technological experts and specialists are necessary to create a quality course and as much as $100,000 or more per course is typically spent on design and support teams, computer programmers, and other experts. Moreover, the technology that is used to deliver the course is constantly evolving so as one course is developed, it is practically obsolete. Therefore, technological creations are not only essential for forward looking courses but must be constantly infused into previously published courses as well. Quality courses deliver cutting edge innovations that are vastly more intricate than a simple recorded lecture. The level of innovation being developed in the MOOC industry is enormous. Online instruction can incorporate a broad range of information, integrating course content with informational resources on the web. Automation, Search Engine Optimization, and artificial intelligence are just some of the integrated technologies. Virtual field trips to museums, foreign countries, and planetariums are already a practical reality. However, the quality of the experience is far from its potential as there are still basic technological hurdles to be overcome. For example, once an instructor decides to offer an online course, creators are faced with many decisions like whether to use a “turn-key” commercial system like BlackBoard or WebCT, or a do-it-yourself software such as NetObjects Fusion, DreamWeaver, or Front page. E-mail exchange methods and correspondence alternatives must also be constantly innovated. Simple back and forth e-mail discussions on a massive scale are essentially unworkable. There must be a mechanism to assist instructors in sorting through the correspondence which takes place in many forms. Some instructors prefer to use conferencing which often does not involve face-to-face interaction and instead uses text-based communication. 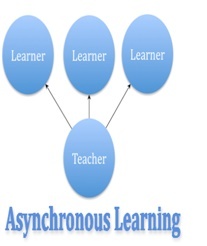 This asynchronous learning allows instructors flexibility and control over the time they spend on any given topic, however, many students often feel disjointed or isolated from the class while they are waiting on a response from the instructor. Alternative approaches involve synchronous communication in which users interact simultaneously via video and audio correspondence. The upside here is that the audio and video can capture personality and learners can receive immediate feedback. The downside however, is that the technology doesn’t always accommodate learners needing more time to reflect before corresponding. Many innovators believe that the MOOCs would be more practical and efficient if the supporting technologies were more developed to assist instructors, analyze data, and provide automatic feedback. The industry is currently in an awkward stage where the demand for education points to an innovative approach, however, the technologies needed to support some of the more enthusiastic agendas are somewhat lacking. One potential solution involves the development of semantic analysis technology which involves sorting through large amounts of text and correspondence searching for patterns and themes inherent in the students’ writing. The computer has the ability to analyze trends so instructors can obtain feedback on how to improve their courses, WebQuests and communications. Similar technology is used to develop automated grading systems. With the immense amount of grading required by MOOC instructors, they are eager for new tools to assist them in the process, however much of the grading software for writing projects is viewed by some critics as rather elementary. Challenges remain in coming up with a universal definition of good writing, and in training a computer to recognize nuances in language style. In time, with larger sets of data, more experts can identify nuanced aspects of writing and improve the technology, said David Williamson, Senior Research Director for Assessment Innovation, a New Jersey based employee recruiting company. edX, a MOOC provider has just introduced automated software to grade open-response questions for use by professors through its free online courses. "One of the challenges in the past was that the code and algorithms were not public. They were seen as black magic," said President Anant Agarwal, noting the technology is in an experimental stage. "With edX, we put the code into open source where you can see how it is done to help us improve it." Last year, the William and Flora Hewlett Foundation sponsored an open-source competition to spur innovation in automated writing assessments that attracted commercial vendors and teams of scientists from around the world. Learning institutions are beginning to accept automated technology as a supplement to human teaching and grading. Automated essay grading which typically requires human instructors to train the software by grading anywhere from 100 to 1,000 essays is particularly popular in the K-12 sector. There it is used for high-stakes testing to essentially mimic the instructors in their grading approach. Perhaps more impressive is that the computer even gives students general comments about their work. If the student doesn’t agree with the results of course, the grade can always be overridden by the instructor. Georgia Tech plans on using computer grading technology to enhance the peer grading that occurs in its MOOCs. Charles Isbell, Senior Associate Dean for the College of Computing at Georgia Tech says, "As the number of students grows, you have to hire more and more of these people. If you want to keep the cost down – if you want to make the degree affordable – the obvious way of doing that is with computer-assisted grading." Of course, the technology has much room to improve. In some instances, students are able to throw off the mechanical grader and obtain a high grade by writing nonsense. The automation still lacks the ability to grade content however, many instructors use it to identify areas of strength or weakness and what the computer currently lacks in creativity and content analysis is being constantly improved as technology develops. Given the technological nature of the MOOC industry, it is no wonder that most of the people in the field are former artificial intelligence experts. Sebastian Thrun recently resigned from the R&D department at Stanford University to create Udacity. edX CEO Anant Agarwal was the former head of the AI department at MIT. No doubt, they envision a world where these technological hurdles will increasingly be overcome so that the demand for quality education and information on a massive scale and for an exceptionally low cost will be a practical reality. The MOOC industry is dominated by a small number of large players, all of whom launched operations within the past five years (Coursera, edX, Udemy, and Udacity). Coursera and edX were launched with investments of about $63 million and $60 million. Udacity was launched with a $200,000 investment by owner Sebastian Thrun and later secured venture capital totaling $50 million. Udemy was basically boot-strapped by its founders after failing to secure investments many times. These innovative companies, sensing an opportunity, are pioneers to provide unprecedented access to knowledge on a massive scale. The opportunity lies in continuously increasing demand for education and information. Research has shown that 17% of employers consider online education to be as valuable as in class education for credentials and skills. Over the last 15 years, billions of dollars have been spent on corporate e-learning, much of which has evolved into mandatory compliance training. Although online education will never replace traditional classroom learning, the opportunities in creating a market for those who cannot access the classroom combined with the rapidly increasing appetite for information are enormous. The MOOC industry is therefore poised to absorb overflows in demand that cannot be efficiently met by the traditional method. Coursera is one of the largest MOOC providers with over 11 million users. Founded by Stanford University professors Andrew Ng and Daphne Koller, their mission is to provide universal access to the world’s best education. Coursera partners over 80 universities and colleges worldwide with universities and organizations worldwide to offer free online courses. The site offers hundreds of courses ranging from Algorithms at Princeton to Animal Behavior at the University of Melbourne. Coursera is also starting to license course materials to universities that want to beef up their existing offering. edX, is a non-profit MOOC provider founded by Harvard University and MIT. Backed by $60 million of university money, edX is now a consortium of 28 institutions who offer interactive classes from the world’s best universities, colleges, and organizations. All courses on the edX platform are available as open source and edX currently has 4 million users in a wide range of disciplines. Rather than focusing on academic institutions, Udemy is platform for experts of any kind to create courses which can be offered to the public, either at no charge or for a fee. Many of their clients are corporations and other institutions that enroll employees to develop job related skills. Udemy for businesses now counts more than 350 paying company partners including 1-800-Flowers.com and Oracle Corp. These programs are especially useful for companies eager to avoid time-consuming, costly lectures. Udemy currently enrolls over 6 million students and offers over 25,000 courses which range from free to a few hundred dollars. Udacity was founded by Sebastian Thrun, the man who helped bring the self-driving car and other technologies through Google’s research division. The company stresses getting students ready for jobs in tech and providing skills that are essential in the job market but may not necessarily have been learned in school. 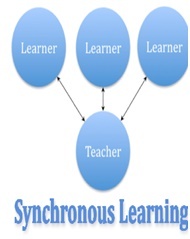 They team up with organizations to develop a new kind of online tech oriented curriculum. Udacity prides itself on being able to better match industry needs with online courses better than anyone else. Similar to that of Udemy, working with companies to train existing and future employees is now the heart of its business model. Udacity recently partnered with AT&T and Georgia Tech, to offer a masters degree in computer science. Course materials will be free, but students will pay around $7,000 dollars for tuition. The largest inherent benefit of MOOCs is their potential to deliver quality, low cost/free education to a large group of users. Students can register with no financial risk, for as many courses as they like and learn at their own pace. There is no right way to do the class or single path from the first week until the last. This allows for new ideas to develop and different ideas to co-exist. The quality of the MOOC courses is often better than one might think. Many MOOCs originate from the world’s top universities. They are often taught by world class professors from traditional top ranking schools. The students are not required to be enrolled in the school or even any degree program at all in order to take the course. Many of the barriers that keep otherwise intelligent students out of the loop are thus eliminated. The potential social benefits of MOOCs are also enormous. Besides creating access points to education and knowledge, many innovators are developing a structure where credentials can be logged and recorded so that employers, governments, and institutions can evaluate course takers and provide credit where credit is due. The Mozilla Foundation, which brought the world Firefox web browser, has spent the last few years creating the “Open Badges” project. Badges are electronic credentials that any organization, collegiate or otherwise, can issue. They indicate specific skills and knowledge, backed by links to electronic evidence. Badges are not limited to what people learn in college and are not controlled by colleges exclusively. In addition, automated technology is being developed that can sift through the electronic badges and discover the exact skill sets and course blends that employers are looking for. Some view MOOCs as lacking some of the basic fundamentals associated with a traditional education such as the benefit of small classes, a 90 minute weekly recap of the material, and office hours four nights per week. Most importantly, they get a credential that is recognized worldwide and necessary for many types of employment and access to alumni networks and mentorship. Another challenge involves keeping students enrolled MOOCs. A widely cited figure is that 90% of students don’t finish their courses. A recent study at Penn State determined that the number was even higher, at 96%. The same study found that only about half of all MOOC students actually view the first lecture at all. The challenge here is figuring out how to keep students attentive and engaged. Perhaps the largest challenge for the MOOCs is funding. Each university has a different approach to funding; some simply absorbing the costs, offering stipends to faculty who develop them or relieving instructors of other obligations to free up their time for MOOC development. Others are seeking support from foundations and donors. Harvard University asks alumni to volunteer their time to help develop MOOCs. Some institutions have been able to cut development costs by utilizing existing materials. For instance, the University of Washington was one of the first 16 universities to join Coursera, but it has been offering free online courses since 2002. Rather than starting from scratch, UW reformatted some of its existing courses to meet Coursera’s criteria, bringing the MOOC costs down to about $25,000 says David Szatmary, VP of UW Educational Outreach. The chart below demonstrates the average production cost of a quality MOOC courses. The costs of producing a MOOC can be quite substantial, however not all MOOCs involve such extreme cost outlays. Lower quality courses can be assembled with nominal cash outlays by instructors attempting to bootstrap a course together however, this type of course will usually be outdone by institutions that have large capital resources available to create higher quality courses and fund widespread promotion. The chart below demonstrates the cost outlays by other universities who have been successful in attracting significant audiences. These costs are more typical for MOOCs. Colleges and universities have adopted several different stances toward engaging with MOOCs. Some institutions like Harvard are actively developing MOOCs, others are using MOOCs created by outside institutions like Harvard to teach enrolled students, and some are simply observing from the sidelines with a “wait-and-see” approach. On one hand, MOOCs may provide access to education for a massive group of people who would not otherwise consider a post high-school education. This in turn would put pressure on costly universities to reduce tuition costs in order to compete for enrollment. On the other hand, some analysts predict the exact opposite effect in which as more users enhance their education, the talent pool may increase, therefore widening selectivity for the brick and mortar establishments, who in turn, will become even more prestigious and thus increase the costs of tuition. Perhaps the most common theme is that MOOCs will be just one of the many choices available to students who will increasingly be able to cherry-pick their educational experiences and create their own unique blend, which may or may not involve a college degree. With this theory, MOOCs will serve a role similar to that previously played by community college, providing low cost, low risk, and lifelong learning opportunities to non-degree seeking adults. Massive open online courses are challenging traditional notions of education. Social advocates see this as an opportunity to challenge traditional ways of thinking about learning and breaking down barriers to education. Meanwhile, industry players see it as an opportunity to create economies of scale and reach the large mass of underprivileged learners around the world who otherwise lack access to affordable education.